> The Mariners have reportedly shown interest in Mat Gamel. I’m going to have an article up tomorrow about how that applies to the Brewers and what they could get in return, but for now I’m going to recap the news I’ve missed over the past few days. > The Brewers added prospects Scooter Gennett, Hiram Burgos, Josh Prince, Nick Bucci, and Khris Davis to their 40-man roster, meaning they’re protected from the upcoming Rule 5 Draft. > The Yankees re-signed Hiroki Kuroda to a one-year deal. I was holding out hope that the Brewers would some how be able to sign him, but it was unlikely the whole time. > The Royals signed Jeremy Guthrie to a three-year deal. He could have been another option for the Brewers, though he was seeking a three-year deal, and I think he’s too dangerous to commit to for that long. > 10 teams have reportedly shown interest in Kyuji Fujikawa. The Brewers could be one of those teams, seeing as Fujikawa is a hard-throwing reliever. Padres: Re-signed Kyle Blanks to a one-year deal; designated Cory Burns for assignment; added Yeison Asencio, Jaff Decker, and Adys Portillo to their 40-man roster. Royals: Released Ysmelin Alcantara, Henry Moreno, and Jose Rodriguez; designated Adam Moore, Vin Mazzaro, Chris Volstad, Ryan Verdugo, Brayan Pena, Clint Robinson, and Derrick Robinson for assignment; added Chris Dwyer, Donnie Joseph, John Lamb, Justin Marks, Mike Montgomery, and J.C. Gutierrez to their 40-man roster; re-signed Brett Hayes to a one-year deal. Pirates: Signed Felix Pie, Brooks Brown, Erik Cordier, David Bromberg, Luis Sanz, and Alex Valdez to minor league deals. Indians: Signed Matt Carson and Cedric Hunter to minor league deals; designated Fabio Martinez for assignment; added Tim Fedroff, T.J. House, Chen-Chang Lee, and Trey Haley to their 40-man roster; outrighted ex-Brewer Matt LaPorta and Brent Lillibridge to Triple-A. Blue Jays: Signed Bobby Korecky, Jim Negrych, Ricardo Nanita, and Alex Hinshaw to minor league deals; designated Mike McDade, Mike McCoy, and Cory Wade for assignment; added Ryan Goins and A.J. Jimenez to their 40-man roster. Mariners: Acquired Robert Andino from the Orioles; designated Chone Figgins and Scott Cousins for assignment; added Julio Morban, Brandon Maurer, Vinnie Catricala, Anthony Fernandez, and Bobby LaFramboise to their 40-man roster. Orioles: Acquired Trayvon Robinson from the Mariners. Mets: Signed Carlos Torres, Scott Rice, and Jamie Hoffmann to minor league deals. Yankees: Claimed Mickey Storey off waivers from the Astros; signed David Herndon to a one-year deal. Athletics: Designated Brandon Hicks and Jim Miller for assignment; added Arnold Leon, Grant Green, Shane Peterson, and Michael Ynoa to their 40-man roster; signed Justin Thomas and Darwin Perez to minor league deals. Rockies: Acquired Ryan Wheeler from the Diamondbacks; outrighted Andrew Brown and Matt McBride to Triple-A. Diamondbacks: Acquired Matt Reynolds from the Rockies; signed Kila Ka’aihue to a minor league deal. Cardinals: Signed Jamie Romak to a minor league deal. Twins: Signed Sam Deduno, Shairon Martis, Luis Perdomo, Esmerling Vasquez, P.J. Walters, Brian Dinkleman, Wilkin Ramirez, James Beresford, Deibinson Romero, Eric Fryer, Tom Boleska, and Jason Christian to minor league deals. Cubs: Acquired Barret Loux from the Rangers; signed Brian Bogusevic, Alberto Gonzalez, Johermyn Chavez, and J.C. Boscan to minor league deals; outrighted Carlos Gutierrez to Triple-A; designated Bryan LaHair for assignment (I have to wonder when the last time a player was DFA’d following an All-Star season). Rangers: Acquired Jake Brigham from the Cubs. Astros: Outrighted Scott Moore to Triple-A. Red Sox: Signed Jonny Gomes to a two-year deal; designated Danny Valencia, Ivan De Jesus, Sandy Rosario, David Carpenter, and Zach Stewart for assignment. White Sox: Re-signed Dewayne Wise to a one-year deal; signed Bryan Anderson and David Purcey to minor league deals. Reds: Signed Emmanuel Burriss to a minor league deal. Nationals: Signed Fernando Abad and Caleb Clay to minor league deals. Dodgers: Signed Nick Evans, Juan Abreu, Kelvin De La Cruz, Miguel Rojas, Hector Correa, Wilkin Castillo, and Gregory Infante to minor league deals. > Schoolwork- endless schoolwork. That’s basically my excuse for getting articles up the past few days. The past three days have been the worst of the year for me. I’m hoping the next few weeks will be at least a bit lighter, otherwise my time to write on BWI will get mercilessly crunched. Anyhow, I’m not going to write a big article today, but all the news I’ve missed should cover that up. > So far, the offseason is going as planned- the Brewers are getting rid of the useless players, so to speak, in order to create roster space. The first batch of players to go is Kameron Loe, Nyjer Morgan, Jose Veras, and Travis Ishikawa. Morgan’s outright to Triple-A (and eventual election of free agency) probably gathered the most national news, especially because of the role he played on the postseason team in 2011. He was responsible for getting the Brewers to the NLCS on that unforgettable walk-off hit against the Diamondbacks in the NLDS, and he ingrained himself into the minds of Brewers fans (and into the minds of other fans, but in a negative way) with all of his aliases. But it just wasn’t Nyjer’s season in 2012. He hit a measly .239, and lost practically all of his playing time so that Carlos Gomez could prepare for a possible starting role in 2013. The emergence of Norichika Aoki didn’t help his cause either. And, with the left-handed Logan Schafer proving that he could possibly play the role of the fourth outfielder in 2013, there just wasn’t a spot for Morgan. So I thank Morgan for all of his contributions in 2011, but his antics and things weren’t fitting this year. Loe and Veras also elected free agency following outright assignments. Loe was one of the Brewers’ best relievers in 2010, posting a 2.78 ERA. He had a second-half surge after getting off two a rough start in 2011, but it was the opposite this year. He had an ERA below 4.00 for most of the season, but it faded all the way to 4.61 in September. Statistically, Veras was one of the Brewers’ best relievers this year (though it’s not good when a guy with a 3.90 ERA is your best reliever). But he quietly had innings just about as frustrating as some of Francisco Rodriguez’s innings, so I’m relatively glad that he’s gone. Lastly, Ishikawa was outrighted to Triple-A today, and is expected to elect free agency after he clears waivers. Ishikawa had his moments with the Brewers, but overall was the poster-boy of an extremely weak Brewers bench. After their 2012 performances, I don’t think any of these players will be missed. 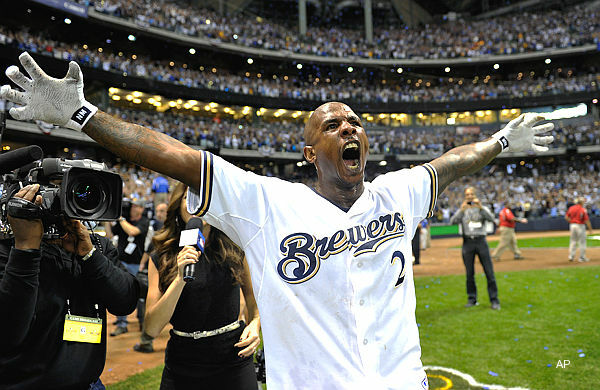 However, Morgan will always be remembered: he’s written his legacy into Milwaukee history. > The Brewers claimed reliever Arcenio Leon off waivers from the Astros. > K-Rod was charged with domestic abuse for that incident in Wales that popped up two months ago. Just stay away from Wisconsin, K-Rod. > Speaking of K-Rod, the Brewers did not give “qualifying offers” to him or Shaun Marcum. This “qualifying offer” thing is something brought about by the new Collective Bargaining Agreement, and basically replaced the Type A/Type B free agent system, which usually determined whether or not a team would receive draft picks as compensation for losing key free agents. Qualifying offers now play that role, and they are determined by the average salary of the top 125 player salaries from the previous season. That salary this season was $13.3 million. As if K-Rod or Marcum are going to get $13.3 million on the market anyway. This was a no-doubter for the Brewers. Only nine players received qualifying offers from their respective teams: Michael Bourn, Josh Hamilton, Rafael Soriano, Nick Swisher, Hiroki Kuroda, Adam LaRoche, David Ortiz, B.J. Upton, and Kyle Lohse. Tigers: Exercised 2013 options for Octavio Dotel and Jhonny Peralta; outrighted Don Kelly to Triple-A. Rays: Exercised 2013 options for James Shields, Fernando Rodney, and Jose Molina; declined 2013 option for Luke Scott. Braves: Exercised 2013 options for Brian McCann, Tim Hudson, and Paul Maholm; claimed Jordan Schafer off waivers from the Astros; outrighted Erik Cordier, J.C. Boscan, and Robert Fish off their 40-man roster. Astros: Designated Matt Downs for assignment; declined 2013 option for Chris Snyder; outrighted Fernando Abad, Sergio Escalona, Edgar Gonzalez, Jose Valdez, and Kyle Weiland to Triple-A. Athletics: Outrighted Dallas Braden and Joey Devine, both of whom elected free agency. White Sox: Signed Jake Peavy to a two-year extension; exercised 2013 option for Gavin Floyd; declined 2013 options for Brett Myers and Kevin Youkilis. Mets: Exercised 2013 options for R.A. Dickey and David Wright. Rangers: Declined 2013 options for Scott Feldman and Yoshinori Tateyama; claimed Konrad Schmidt off waivers from the D-backs. Cubs: Outrighted Justin Germano to Triple-A, who elected free agency. Dodgers: Re-signed Brandon League to a three-year deal. Orioles: Declined 2013 option for Mark Reynolds. Indians: Exercised 2013 option for Ubaldo Jimenez; declined 2013 options for Travis Hafner and Roberto Hernandez (I still call him Fausto Carmona); outrighted Kevin Slowey and Vinny Rottino to Triple-A; claimed Blake Wood off waivers from the Royals. Royals: Declined 2013 option for Joakim Soria; acquired Ervin Santana from the Angels; claimed Guillermo Moscoso off waivers from the Rockies; claimed Brett Hayes off waivers from the Marlins; designated ex-Brewer Jeremy Jeffress and Jason Bourgeois for assignment. Yankees: Outrighted ex-Brewer Casey McGehee to Triple-A, who elected free agency; returned Rule 5 Draft pick Brad Meyers to the Nationals. Reds: Ryan Ludwick and Ryan Madson each declined his side of his mutual option for 2013. Pirates: Exercised 2013 option for Pedro Alvarez; declined 2013 option for Rod Barajas; released Hisanori Takahashi. Blue Jays: Claimed Scott Maine off waivers from the Cubs; designated Scott Cousins and David Herndon for assignment; exercised 2013 option for Darren Oliver; re-signed Rajai Davis. Diamondbacks: Declined 2013 options for ex-Brewer Henry Blanco and Matt Lindstrom. Rockies: Ex-Brewer Jorge De La Rosa exercised his player option. Nationals: LaRoche and Sean Burnett each declined their player options. Giants: Declined 2013 option for Aubrey Huff. Twins: Claimed Josh Roenicke and Thomas Field off waivers from the Rockies. Orioles: Claimed Alexi Casilla off waivers from the Twins. Padres: Designated Josh Spence and Blake Tekotte for assignment.